Virtual Radar Server can display the location of simulated aircraft flown in FSX as well as the locations of real aircraft. The connection to Flight Simulator X is controlled through the menu option File | Flight Simulator X Mode. You can use the Flight Simulator X features without having an ADS-B radio or a connection to BaseStation. You do, however, need to have Flight Simulator X installed before FSX mode will do anything useful. Earlier versions of Flight Simulator will not work with Virtual Radar Server, it uses SimConnect and this was introduced with Flight Simulator X. Virtual Radar Server has a separate web page to display the location of a simulated aircraft. When you connect to FSX it does not interfere with the display of aircraft being received by BaseStation, that still runs as per normal. The address of the flight simulator aircraft page is shown in the bottom-left of the screen and can also be displayed on the Main Screen. This shows you the status of the connection to Flight Simulator X. If you do not have FSX installed then it will say so here. This establishes a connection to a running copy of FSX. If there was a problem establishing the connection then a message will be shown against Status. 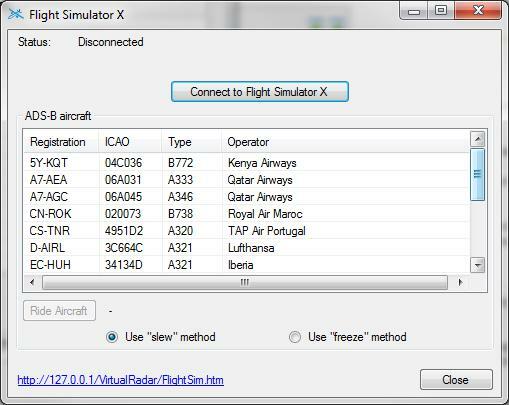 You will need to connect to FSX and leave this window open in order to display FSX aircraft on the map or have VRS control the aircraft within FSX. Closing this window will break the connection to Flight Simulator X. Virtual Radar Server can be used to control the aircraft in Flight Simulator X as well as display its location on a map. Specifically it can be used to keep the simulated aircraft at the same positon, altitude and approximate attitude as a real aircraft that is transmitting ADS-B messages. This list shows all of the real aircraft that the program is tracking via the BaseStation feed. Selecting one of these and then clicking the Ride Aircraft button will tell Virtual Radar Server to update the simulated aircraft in FSX with the real aircraft's position and altitude. You can turn the feature off by either clicking the Ride Aircraft button again or by toggling slew mode (press Y twice) in Flight Simulator X.
FSX provides two methods of keeping the simulated aircraft's position in sync with a real aircraft's location. Slew turns on FSX's slew mode and then periodically updates the aircraft's location. This stops sounds from playing in FSX and the aircraft's nose can dip or raise between updates, but FSX will not register collisions with the ground nor will it check to see if the aircraft is stressed. Freeze turns FSX's slew mode off and instead asks FSX to freeze the aircraft's altitude, attitude and position. It then periodically updates these. This allows sounds to continue playing in FSX and doesn't allow the nose to dip or raise between updates, but because the aircraft is otherwise flying normally FSX will check for collisions with the ground or buildings and it will also detect overspeeds. To try to prevent overspeeds Virtual Radar Server will ask FSX for the barber pole speed of the simulated aircraft and try to keep the speed to about 30 knots below this, but it's not always perfect. VRS tries to approximate the bank angle from changes in the ground track of an aircraft. It as it has no idea what the aircraft's pitch is so it always leaves that level.